Holiday Closing: The office will be closing at 12:30pm Wednesday, November 21st and will continue to be closed through Sunday, November 25th for Thanksgiving. Friends and Family Day: Wednesday, November 14th! FREE 1st Visit for New Patients. 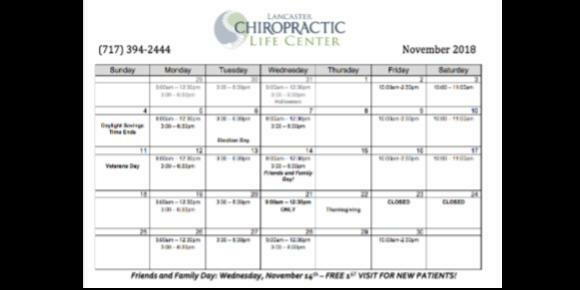 Great opportunity for your loved ones to see what this Chiropractic thing is all about! Offer includes exam/consultation, thermal scan, x-rays (if needed), first adjustment and report of findings. Offer is valid on this day only and only available to new patients. Spaces are limited, please reserve ahead of time! How do infants benefit from chiropractic care? Chiropractic for infants? They have low back pain? Hardly – yet infants need chiropractic care to ensure that the stress of delivery and labor hasn’t damaged their spines and delicate structural systems. Other stresses can involve falls – statistics tell us that nearly half of all babies have had a fall from a height (off the changing table, off the bed, etc.). Chiropractic care will help ensure a healthy baby with better resistance to disease and better ability to discharge toxins. Also, correcting subluxations may help a baby who is ill return to health more quickly and comfortably. There are many case histories of chiropractic helping children with all kinds of conditions – asthma, colic, difficulty breastfeeding, ear infections, autism spectrum disorder, vision and hearing disorders, neurological conditions – no matter what conditions babies may have, chiropractic care can help tham grow into healthy, happy children. Childhood is a rough time, full of falls, trips and even traumas. A physical, emotional, or chemical (toxic) trauma experienced as a young child could cause subluxations that affect internal organs, mental health, overall resistance to disease, strength and balance. Chiropractic helps keep children healthy naturally. As with babies and infants, every child needs periodic chiropractic checkups in order to grow up healthy and happy. How do students benefit from chiropractic care? Chiropractic care, by releasing stress from the brain and nervous system, may improve concentraion, attention span, grades, and interpersonal behavior. Chiropractic has been shown to increase IQ, to help coordination and self-esteem, and to improve body function. No matter what health problems a student may have, chiropractic will help improve their chances of healing naturally. How do adults benefit from chiropractic care? Physical, emotional, and chemical stresses accumulate as we age. For more energy and for improved function of the immune system, digestive system, eliminative system, cardiovascular system and other systems, your body needs unobstructed communications. For a healthier life, periodic chiropractic care is absolutely necessary. Chiropractic helps people live free of obstructions caused by subluxations – structural distortions that interfere with internal (nerve) communication and energy flow. How does chiropractic help women? The pelvic area receives an intense amount of nerve communications. The ovaries, uterus, tubes, kidneys, adrenal glands, and other internal organs all need a healthy nerve supply to function properly. Clinical studies show chiropractic helps women with menstrual pain and discomfort, menstrual irregularities, fertility, and menopause. How does chiropractic help pregnancy and post-pregnancy? If there’s any class of patients that need chiropractic care the most it’s pregnant women. Pregnancy changes a woman’s balance and can make distortions more severe which can cause pain and exhaustion. Chiropractic can help ensure that the body is balanced and that the pelvis is relaxed and open so the developing baby has the maximum amount of room in which to develop. Clincical research reveals that breech presentations have been correctd, with the fetus turning into a healthy position, as a result of chiropractic pelvic-balancing procedures. Clinical reports show chiropractic also helps with breastfeeding and the return to a pre-pregnancy figure. How does chiropractic help sports performance? Many top athletes from all over the world rely on chiropractic to keep their body structure balanced, their nerve system healthy and their muscles functioning at their peak. Chiropractic can help prevent sports injuries but can also help an injured player return to the game or competition faster. Of course you don’t need to be an Olympian to go to a chiropractor; anyone who uses his/her body needs it to function at its peak. How do the elderly benefit from chiropractic care? The elderly are among our most drugged citizens. It is not unusual for someone to be taking many different medications and suffering from serious reactions to them. Many times people are taking drugs that interact in ways that are more damaging than if they took them individually. Chiropractic offers a drug-free alternative to an over-drugged population. Why? Because your body is the world’s greatest drugstore, able to make every drug and chemical you need. Chiropractic helps turn on this internal pharmacy. The spirit of the season makes us especially thankful for our many patients and friends like you.